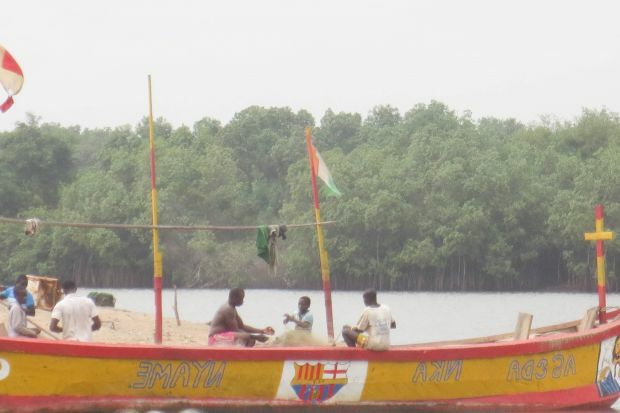 Located between the lagoon and the sea in the Fresco landscape in Côte d’Ivoire are two fishing communities on a small Island. Members of these communities derive their source of livelihoods (food and income) mainly from the sea. However, rising sea levels and erosion are threatening their lives and existence. “This Island was like 10 times the current size but the sea has taken away all our houses in the past five years now, leaving us with this small space to occupy. Now, every Monday, the sea level becomes very high and in the evenings, we have to send our children to sleep at the inland at the main Fresco town whiles we the adults sleep on high level benches” stated Yao Antoine, Spokesperson of the Chief of the Fishing Camp 1 at Old Fresco. The storm of the sea is not only denying the communities a good night’s sleep but also negatively affecting their fishing activity. “It is difficult nowadays to have a good catch when we go fishing. 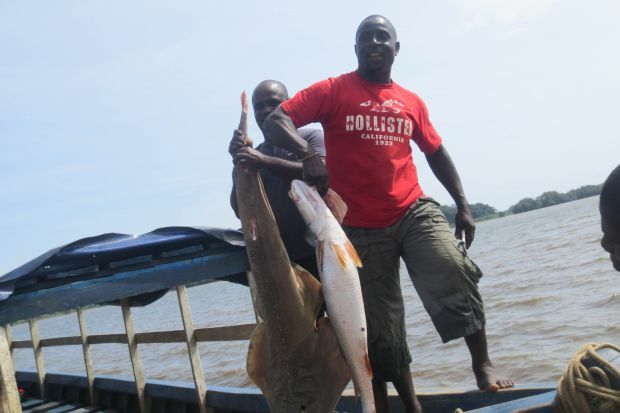 This is because the farthest we used to go was 7 miles but now we have to travel very far, for about 25 miles before catching fish”, noted Nana Kwame, a fisherman at the Fishing Camp 2. Not only do these fisher folk have to travel several miles to fish but they are also compelled to stay longer on sea and only return as at when they are able to catch enough fish. Changes in climatic conditions are cited as the main cause of the woes of these fisher folk as they observed the negative impact of increasing temperature and storms on their fishing activities. One may propose relocation as the easiest solution but these fishermen think otherwise. “We can’t leave this Island because as fishermen, we need to be close to the sea to better study it and understand its dynamics”, stated Nana Kwame. Interestingly, in the absence of weather forecast, members of these communities can predict weather changes by using the cloud and the temperature of the sea. According to them, the hotter the sea water becomes, the more likely there will be storms and flooding. This means of weather forecast, they admitted, is not always predictable, as they are sometimes taken unawares by storm and flooding, which often result in the loss of properties. It may be useful to consider interventions targeting relocation and lagoon fish farming programs for the affected communities so as to help build their resilience to adapt to climate change impacts. Periodic weather information may also help these fishing communities to be able to predict the weather, in order to avert disaster and the loss of properties. The experience of members of these fishing communities are examples of the significant effects of climate change on the lives of coastal communities. It is therefore important to assess the vulnerability of people living along the coast in order to initiate appropriate adaptation measures to help them build resilience to climate change. In this regard, the United Nations University Institute for Natural Resources in Africa (UNU-INRA), with support from USAID through the West Africa Biodiversity and Climate Change (WABiCC) programme, is conducting a climate change vulnerability assessment to identify options to inform interventions to build resilience for coastal communities in the Fresco lagoon landscape and its environs in Côte d’Ivoire.